Gateways may be used as intermediaries to establish sessions and conduct webRTC communications between disparate end points. When WebRTC end points can’t connect directly, gateways may be used as a fallback to establish sessions and handle communications. 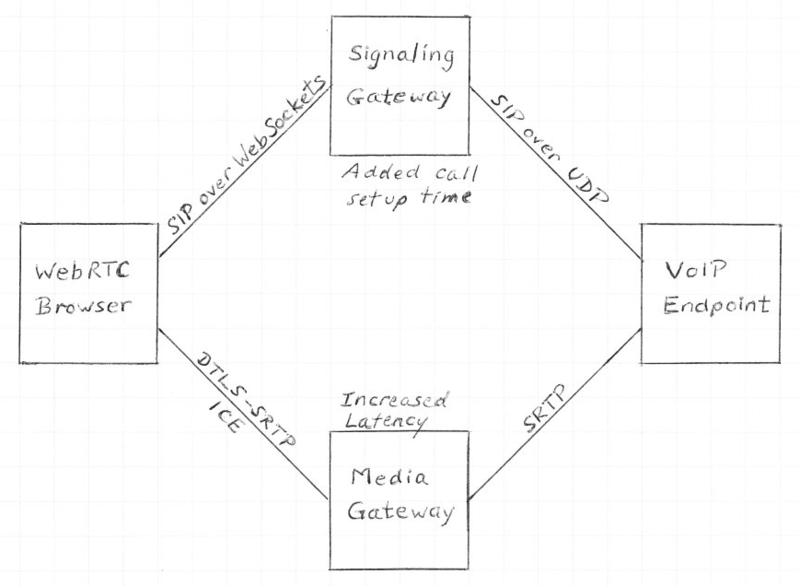 Two types of gateways can be used with WebRTC; signaling gateways, and media gateways. It is important to note that gateways can cost additional resources. As such, it can be very beneficial for a VoIP device to be compatible with WebRTC standards and communicate directly with a web browser without the need for intermediaries. Contact us to discuss your WebRTC application requirements. Signaling gateways convert the application level connection establishment to a form that a peer endpoint can understand. For example, if a web browser wants to connect to a VOIP device, they must be able to communicate over the signaling layer. The browser communicates over web sockets using an arbitrary protocol (possibly proprietary) and the VOIP device only understands SIP over UDP. The gateway can talk to the browser using web sockets and talk to the device using SIP over UDP. The gateway will simply reformat the messages to the appropriate protocol and route them to the other user. A similar task is performed by the media gateways. These gateways can be used for media layer connections between users. If a browser is trying to communicate with a VOIP device that does not have the ability to establish a DTLS connection then it could use a media gateway to translate between the browser and the device.